Yoga class (suited for all abilities), followed by relaxation to release big day jitters. Guaranteed to nurture and revive. The class starts with warm ups,you will then be guided to try out the fun yoga postures. There is always lots of fun and laughter! We finish with a deep relaxation designed to release stress and anxiety. Alternative postures will be offered to cover all abilities including pregnancy. All mats will be provided. Group yoga or Pilates 1 hour class, suited for all levels. Great for team building and bonding. Choose from standard yoga class, partner yoga, strength and core class, meditation or stress relief techniques or a combination class tailored to your request. All mats will be provided. Contact me to agree a date or book now. 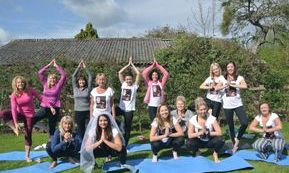 Classes can be practiced in a venue your choice in the South West area, a back garden, patio, at the beautiful Victoria Park, Bath or Sandhya can help you find a suitable hall nearby. Below is a sample of venues and their hall hire rate in Bath.